Building Maker: It's ALIVE! It's ALIVE! Woo-hoo! Today I saw my model re-texture itself in Building Maker. This is one of the cool new functions of the Building Maker program... as you build more, the program senses what buildings obstruct the view of others, and what vantage point offers a clear view (and texture) and then re-applies textures accordingly. In my case I am making a model of the Piazza San Marco in Venice. A wall was incorrectly textured but as soon as I built the part of the building blocking the view, Building Maker found a better angle and fixed the texture. Cool. Hello Everyone. A while back, I won something and announced it prematurely by accident (oops, sorry!). So today, I can announce it officially because it was posted HERE at the Monopoly City Streets blog and HERE at the Google SketchUp blog. What did I win? I entered a competition to design a new building with SketchUp, to be used in game play for the Monopoly City Streets online real estate trading game. I made and submitted about a dozen buildings, and the one pictured won second prize. 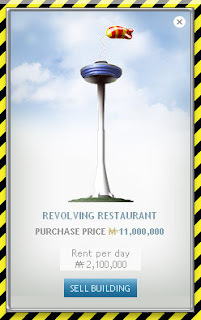 It's called Revolving Restaurant and it is a tower with a blimp attached. My prize is the inclusion of this building in the online the Monopoly City Streets game. There you can buy and trade this building along with many others, including the two additonal winners. Thanks to Hasbro, Monopoly, SketchUp, and Google for sponsoring the contest! "Reading your blog is both entertaining and informative. I like your personal approach to stories around SketchUp and geo-modeling. Again, I got something you may find worth reporting about. "Today it’s been 20 years that the Berlin wall was brought down by East Germans who were fed up with the oppression and lack of development in their country. I used to live close to the wall for many years, at its western side. As a matter of fact, one wall of the building I lived in for the last six years of the Berlin Wall’s existence was the border line. Of course, I was out on the streets cheering with thousands of fellow Berliners that night the wall came down. Two days later my daughter was born and we had to call the ambulance in order to reach the nearby hospital because there was no way to get through the cheering crowds in a private car. SketchUp Islander Aerilius has created a unique "interactive history" model of the Limburg Monastery. The above illustration is a reconstruction. Below is an illustration of the ruins of the same structure, located on Google Earth today. The tour and multi-layered model created by Aerilius is one of th best (both beautiful and most interesting... and functional) I have ever seen on Google Earth. It runs smoothly and includes attractive history "pop up bubbles" describing the building as it existed in stages over its 700 year history. If you like buildings and history, check it out. Models like this could be used for a potential "3D historic buildings layer" on Google Earth which I mentioned in this post. To download and see these models in 3D just click on the images. Happy weekend, Everybody! Labels: Buildings, Historic Building Models, Interactive Models, Why Model?